Sunday evening Joey finds me making a onesie for Joaquin. I tell him that I’m going to bed early with him. I’m a little bummed. Nobody will buy my stuff at Etsy. Just a couple of people show interest in my hats, and nobody seems to care for the mini wallet. I’m never going to sell a thing. Poor old me. Next morning I’m getting ready for Joaquin’s class at the Little Gym. I hate having to leave my purse in their cubicles out of the room. When Joaquin was a “bug” I could just take my purse in, but now that we’re in the “birds” class, any of those babies could get it. I’m from Colombia and so I’m a little paranoid about stuff being stolen (not by babies, of course). The diapers and wipes, who cares. But my wallet would be very annoying to lose. 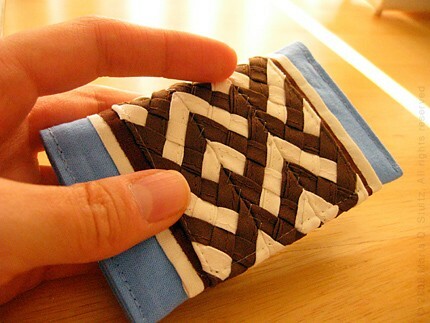 I make a decision: I’ll become the happy owner of one of my mini wallets. They won’t sell any way… So I go to my Etsy shop and decrease the stock of mini wallets for sale by one, and proceed to fill one of them with my essentials. The thought that the universe is full of silly coincidences and hence, I may sell one of those wallets today, crosses my mind very briefly. I don’t dwell on it, though. That afternoon Joaquin is taking his nap, and for the first time in about a month, I don’t use the precious time to craft. I’m still a little bummed and just throw myself in the couch to watch “Cold Mountain”. Beautiful, yet terribly tragic and sad movie. In the evening we’re working on getting Joaquin to bed. While I leave the room to prepare a bottle, I give a quick look to my email. 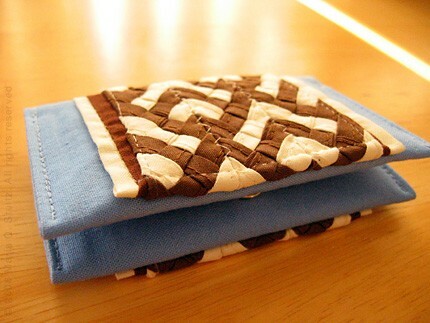 There are two messages in my inbox: 1) Etsy tells me that I’ve sold one of my mini wallets. 2) PayPal confirms that the buyer has sent payment. A few minutes later Joaquin is asleep and I check my email again. There are another two new messages in my inbox. One of Etsy’s sellers congratulates me because one of my products is featured on Etsy’s home page. Guess which one… That’s right — the mini wallet. She sends me a screenshot in case I missed it, which is really great because although I do get to see it real time on the web site, 10 minutes later the list of featured products is refreshed and I’m no longer there. The wallet gets 754 views (about 700 more than an hour before), 18 users add it to their favorites, and 9 users add my shop to their favorites. My life likes to play like that. And this kind of situation gets me every time. Reminds me of the day someone put one of my absidea articles up on reddit and it went on top and stayed there for six or seven hours. I had close to 80,000 hits and 80 comments to answer. Which also reminds me that that blog is still off-line and that’s a real pity. I know I have to move it and dust it before November NaBloPoMo for absidea Season 3. If boy#2 does not take up all our energy, I know I’ll be busy during paternity leave.